Say you have deep pockets and want to buy the best PSU available on the market. Thus far, that PSU has been the Corsair AX1500i, which, although it has by now been around for several years, still hasn't been dethroned, achieving a higher overall performance score than any other PSU. Yet the performance gap with such top competitors as the mighty EVGA SuperNova 1600 T2 based on an excellent Super Flower platform has started to narrow, which had Corsair decide that it is time to introduce something even better, the AX1600i, which not only performs better but is 100 W stronger, which has it go toe to toe with the SuperNova 1600 T2. With a price tag of $450 (the AX1500i's street pricing is currently $50 less), the AX1600i surely isn't a PSU that will be sold in huge numbers, so one is right to ask why Corsair would spend so much time and money on creating it in the first place. The answer to this question is fairly simple: because it can, along with Flextronics' help, and this does again let everyone around the globe know that Corsair is the king of the PSU game since its flagship offering stands above all other competitive high-end offerings. 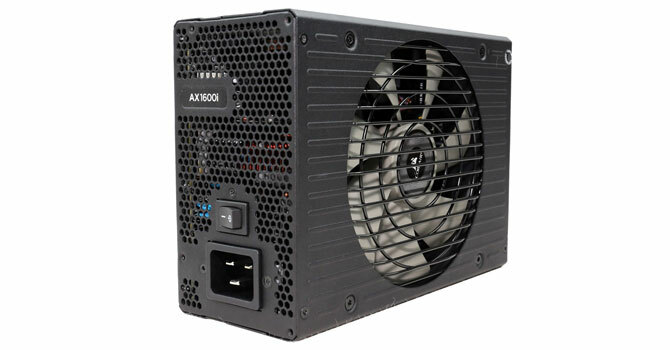 As we see it, the AX1600i is a prestigious product, like Formula One cars are for their respective manufacturers, with the only difference being that you can actually buy this PSU if you can afford it. The major innovation with the fully digital platform the AX1600i uses is a new type of FET based on a material called Gallium Nitride (GaN) - instead of common Silicon. Due to its extremely low gate charge and output capacitance, GaN FETs can be switched at extremely high speeds with reduced switching losses and improved efficiency when compared to silicon FETs. GaN FETs, or MODFETs as they are also called, also offer up to 40% more power density than their silicon counterparts, and their faster switching speeds help minimize the dimensions of other components, especially transformers. The use of GaN FETs is essential for the innovative totem-pole bridgeless PFC converter the AX1600i uses to achieve its considerably higher efficiency with its multi-rail output architecture. A typical bridgeless APFC converter in a high-end PSU like the 1600 T2 is able to offer up to 96% efficiency, while a totem-pole bridgeless PFC can reach up to 99% efficiency! 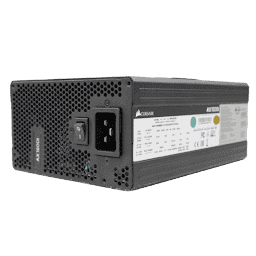 A difference of 3% might look small to some of you, but is not, especially in a PSU with such a gargantuan capacity, as such a percentile difference can translate into a thermal load that is reduced by up to 50 W when it comes to cooling this PSU.